There's a brand new trailer and a new release date for DC Universe's next animated feature, Green Lantern: First Flight. The trailer looks pretty epic, and if anything, should serve as a good blueprint for the upcoming live-action Green Lantern movie, which is still in the casting stages. Green Lantern: First Flight is the re-imagined origin story of Silver Age Green Lantern, Hal Jordan. The film will mainly be set in space, and will feature all sorts of aliens and intergalactic battles and all kinds of crazy power-ring creations (as you can see from the trailer). First Flight is being helmed by DC Universe's Lauren Montgomery, the same brilliant little lady behind DC Universe's other great features, Superman: Doomsday and Wonder Woman. Lending their voices to the film will be Christopher Meloni (Law And Order: SVU) as Hal Jordan; Victor Garber (ALIAS) as Hal Jordan’s nemesis, Sinestro; Michael Madsen as Hal Jordan’s alien mentor, Kilowog; and the lovely Tricia Helfer (Battlestar Galactica) as Green Lantern Corps member, Boodikka. Bruce Timm will be producing the film. Now, about that earlier release date. 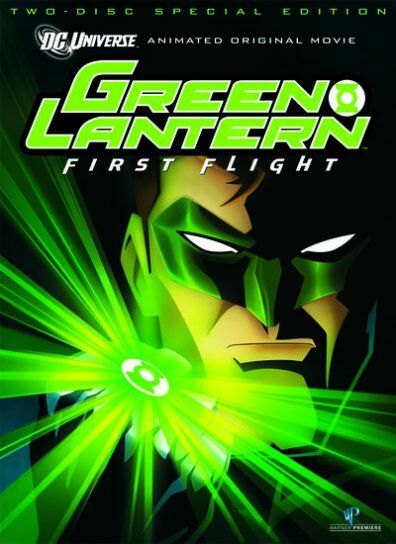 Fans will be able to pick it up Green Lantern: First Flight on July 21, 2009--one whole week earlier than the original July 28 release date. The film will also be rated PG-13, which spells, "Animated action adults can enjoy." What do you think of the new trailer and release date for Green Lantern: First Flight? Is this a film you'll be checking out, or does Green Lantern still not rank on your superhero radar?